The desire to share ideas. The power of the spoken word. The capacity to listen. The ability to internalize. The need to connect. 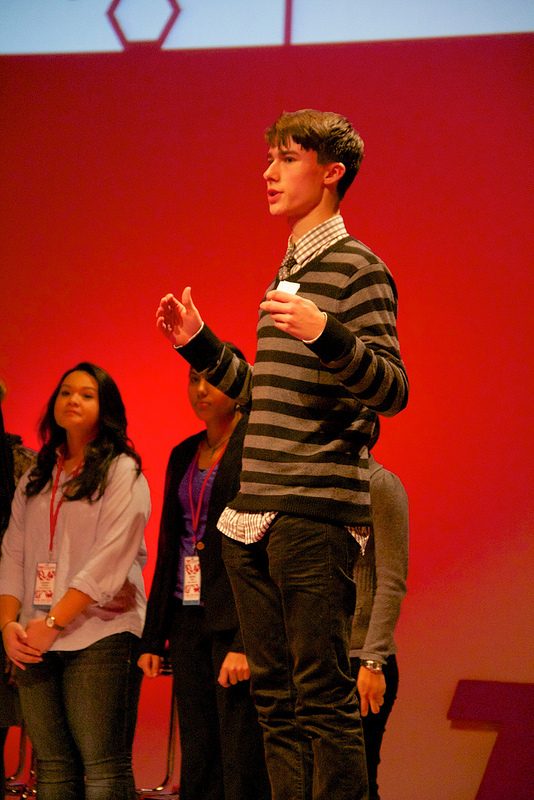 This was the TEDxCharlotte experience. On Friday, February 15 from 9 AM — 4:54 PM, Silver Hammer Studios at the NC Music Factory became a blank canvas for sharing “unlimited” ideas. Fourteen individuals from the Charlotte community took center stage at TEDxCharlotte to share their stories and spread their ideas. TED, the Technology, Entertainment, and Design Conference, is a nonprofit organization devoted to “Ideas Worth Spreading.” It was founded in 1984 as a one-off event with an emphasis on technology and design. TED has grown into an annual conference that provides the world’s leading thinkers and doers a platform to spread ides thorough short-from discourse. 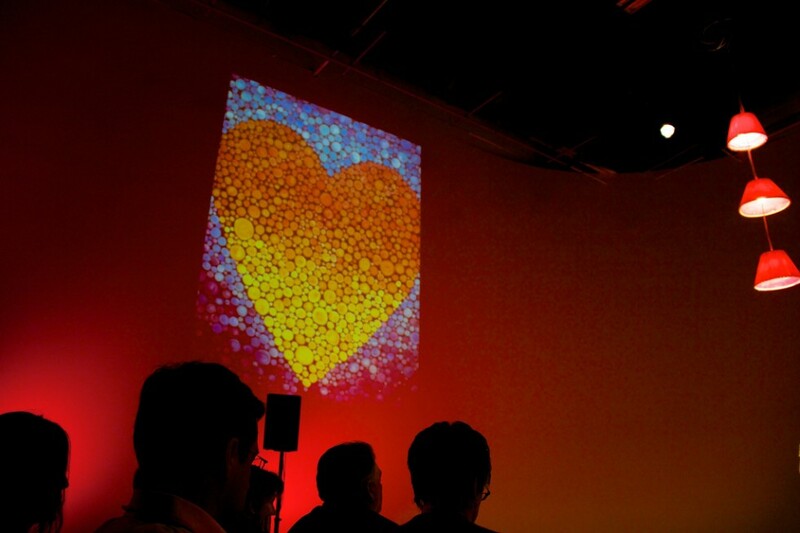 In 2009 TED began granting licenses to third-party organizers for hosting independent TED-formatted events. Hence “TEDx” was born. Walking into the Silver Hammer Studios, the concept of “unlimited thinking” engulfed me. The warehouse’s vaulted ceilings and extended walls made the space feel infinite. A massive screen of dancing red graphics captured my attention just before walking into the all white studio where the main event would take place. When an artist stares at a blank white canvas, or a blank white word processing screen stares at a scholar, an endless number of ideas can be projected into the universe. Once the blankness is stained with an ounce of paint or a single letter, the unlimited ideas start to become specific concepts, geared to a specific audience, suited for a particular moment in time. So it was at TEDxCharlotte, where more the minds of 450 attendees where stained with the idea that dreaming big and stopping at nothing to make those dreams happen is not just possible, but necessary. The first speakers to step to the small, circular, red-carpeted stage was the Lewis Family. JD Lewis, 54, his sons Jackson, 15, and Buck, 10, made themselves comfortable on the stage. 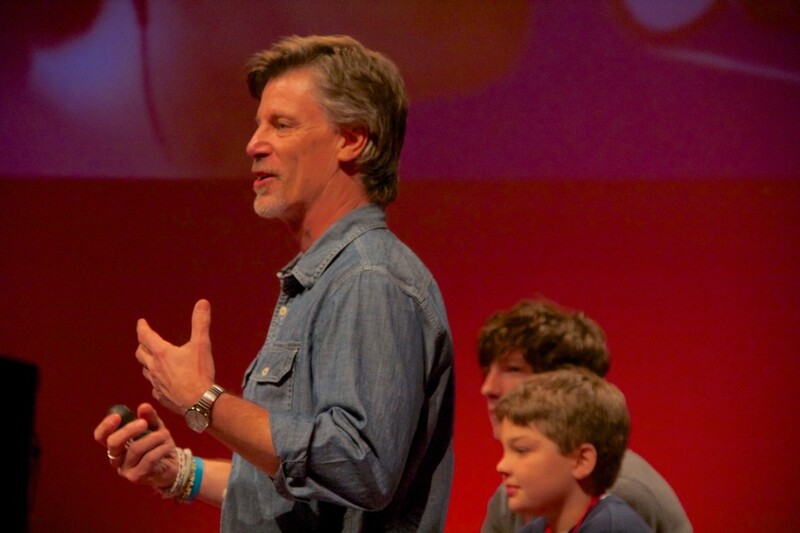 The boys hopped atop stools as JD took the led to share their Twelve In Twelve story with an awaiting TEDx public. Twelve In Twelve is a Charlotte-based non-profit that took the Lewis family on a humanitarian adventure around the world in 2012. They visited all seven continents completing humanitarian task all while learning about themselves along the way. The project started in the socially conscious mind of a then 13-year-old Jackson. Jackson felt that he, his brother, and dad had such an incredible life thanks to his father’s successful acting career. J.D. is known for his work on shows like ER, Friends, and Suddenly Susan. Jackson challenged that now was the time for the family to help others in the world. The next morning JD decided his teenage son was right and the Twelve In Twelve project was born. JD revealed that he had heard the word “no” and phrases like “you can’t do that” almost all of his life from naysayers looking to help him, not harm him. As JD grew older and wiser he realized that naysaying is coming from a place of the naysayers own fears and doubts. He said that the times when he decided to accept the “no’s” and internalize the “you can’t do that’s” he was often lead down a path of regret. Click here for the Lewis Family TEDxCharlotte profile. 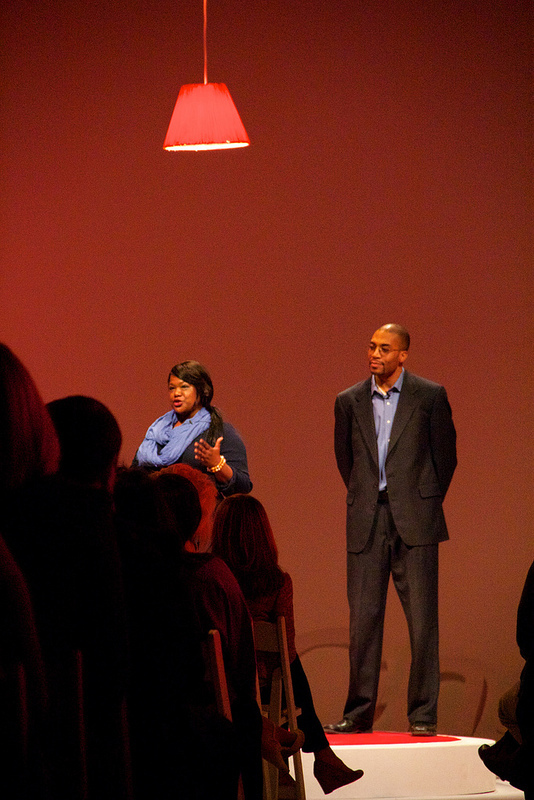 Next to the TEDxCharlotte stage were “Giving Back” author and photographer Valaida Fullwood and Charles Thomas. For Valaida, the stories that framed the definition of what it meant to be a philanthropists disturbed her immensely. After examining the Greek translation of the word “philanthropy,” which literally meant “love of humankind; love of humanity,” Valaida knew she had to reframe the meaning of philanthropy in America. The frame that she saw society using to define philanthropy was directly connected to the number of zeros a person added to a philanthropic check. Valaida vowed that she would be a change agent that helped to reframe what it meant to be a philanthropist in American Society. For Valaida, growing up watching her Aunt Dora act as an “every day giver” was the catalyst that drove her to tell a new story of philanthropy. At the age of 92, Valaida’s Aunt Dora continues to pour her Social Security check into her nonprofit Our Daily Bread soup kitchen. Valaida’s book shares the philanthropic story of her Aunt Dora’s and 199 other African American philanthropists. Charles Thomas served as the book’s Photographer and pictorial philanthropy reframer. Charles found solace in Photography when he enrolled in college. For many years he struggled with his self-identity as a fatherless child and atypical academically gift black kid in his middle and high school days. In college, the Photography assignment that urged him to create a self-portrait of himself and his father pushed him to reframe his relationship with his absentee dad. After that assignment, Charles then took up the mission to reframe the images of black men and the widely-accepted notions of what it meant to be Black in America through his lens. When Valaida combined her words with Charles’ portraits into one book, the frame of philanthropy would be forever changed in the minds of all the individuals exposed to these stories and pictures in “Giving Back”. This pair of change agents challenged the audience to share untold stories and to step out of the frames society has locked them into . 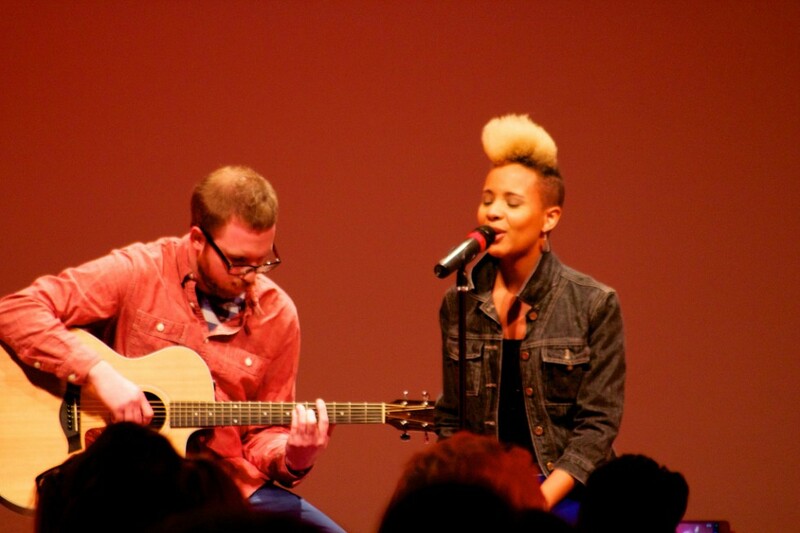 Click here for the Valaida Fullwood and Charles Thomas TEDxCharlotte profile. Patricia Shafer was the final act to come to the circular red carpet before the first scheduled break. She shared the concept of the “mosaic model.” She emphasized the power of collaboration over the power of the individual, especially when it comes to projects designed to change the world for the better. That is the idea behind her non-profit Mothering Across Continents. It is a non-profit where volunteer “catalysts” receive consulting, coaching, and mentoring to develop their dream projects. The goal is to help raise the leaders of tomorrow. All Mothering Across Continents projects start with a potential catalyst like Philips or Elizabeth. These grassroots humanitarian ideas often needs focus, strategic planning, and manpower. And, to Patricia these obstacles are never a good enough reason to stifle an idea that can positively impact the world. 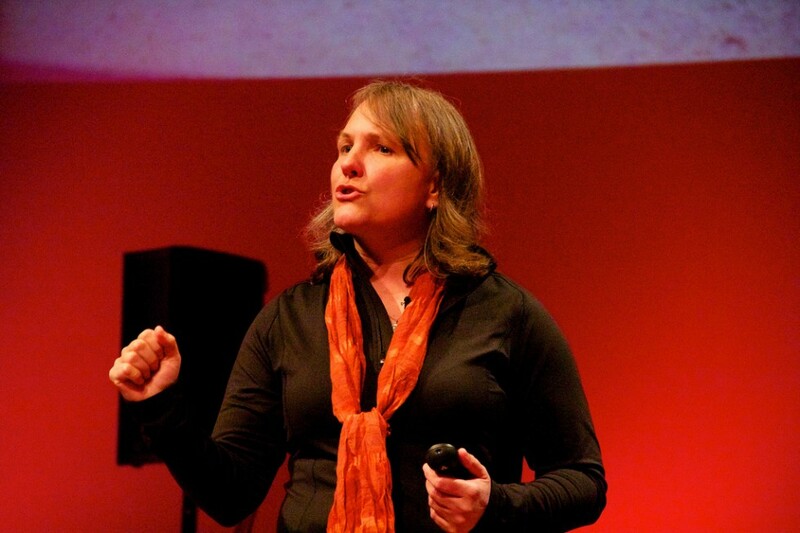 Click here for the Patricia Shafer TEDxCharlotte profile. After the break and a performance by Kim Jones and the “Unlimited” dancers, the fresh faced TEDx Youth Engagement Team address the idea of “youth apathy.” Casey Aldrigde explained that it was actually a barrier of communication that leaves many with the impression that youth, more specifically teens, are apathetic. Casey said the older generation viewed changing government policy as the only way to make an significant impact. Casey explained that today’s youth view volunteerism as their best method of making a direct change in the world. Casey said that youth feel like they have no say in government issues. Those under 18 don’t have a vote that counts, but they can make it count directly when they volunteer and pledge their support for a cause explained Casey. Cassie Parsons, restaurant owner and chef at Harvest Moon Grille, came to TEDxCharlotte to explain to attendees a simple way that they could change the world—eat. Cassie said that being an educated food consumer can change the way the food industry does business. Cassie explained how the food industry was broken. As a farmer herself she knew that our food growers were encouraged to pump livestock with steroids to make them grow faster. Show knows that farm animals are feed antibiotics so they can travel long distances during the food distribution process. Farmers that practice this method of livestock farming are subsidized by big brand meat packers. They are rewarded with the ability to make decent living at the expense of delivering augmented food to grocery store shelves. Cassie then placed these questions in the mind of the TEDxCharlotte audience: If there are over 1800 restaurants in Charlotte, why are they all feeding us the same food from the same place? Why is the food not coming from Charlotte or Concord or Lincolnton? The concept of buying local is not a widely accepted model in the food industry. Cassie explained that there are four simple things we can all do that can change the way a whole industry, in this case the food industry, does business. Go to the farmers market. Only buy meat that you know all the facts about. Have conversations about the food you eat. After Cassie’s speech the organizers and the audience broke for a lunch provided by Cassie’s Harvest Moon Grille. 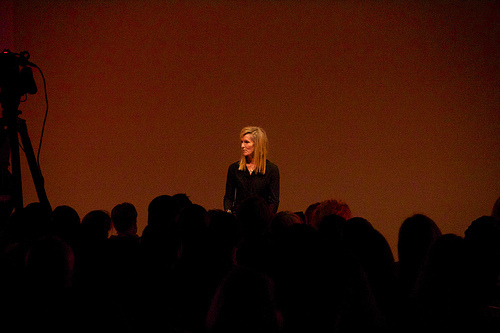 Click here for the Cassie Parsons TEDxCharlotte profile. With bellies full and the lights dim, people nestled back in their seats awaiting their next dose of inspiration. jocElyn Ellis and Red Jesse confidently walked to the stage after a quick side stage prayer and provided just that. jocElyn and Red performed “Dawn of Inspiration,” a song encouraging people to think and act without placing limit on themselves. Once the song ended, jocElyn stood up from her stool and began to share her idea—that self-expression defies the limits society tries to place on individuals. She explained, “Once you express yourself, you are giving an immortality to what you believe in.” She went on to explain that self-expression grows exponentially. She broke it down for the crowd of onlookers like this: If she expressed something to you, you now share her idea with someone else, that person now share it with another, and then another. Her idea now continues on in the collective conscious of the universe, and it all started from her simply acting on her decision to outwardly expressing herself. jocElyn then closed with the song “Burn, Burn” about a man who shared great tidbits of wisdom with her when she was young. Click here for the jocElyn Ellis TEDxCharlotte profile. After jocElyn spoke to the artists in us all, Chad Henderson spoke to the dreamer in us all. 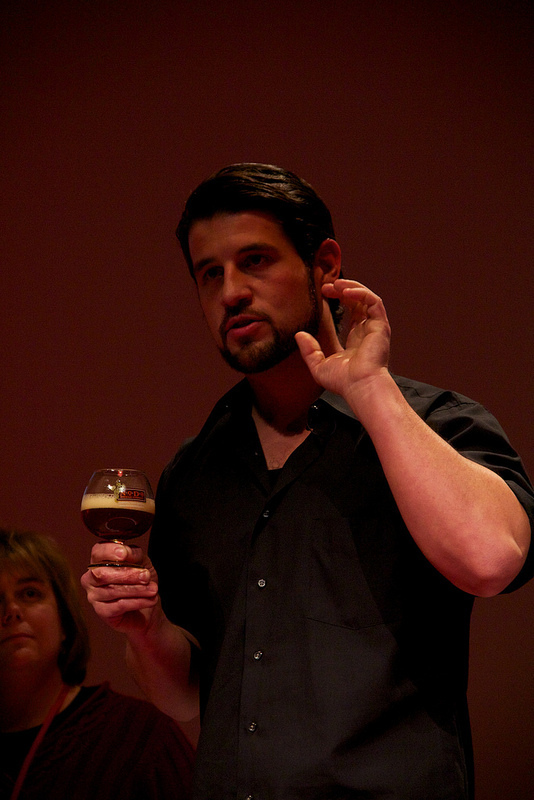 Chad told of his journey that led him to his dream job as a craft beer brewer. His passion for craft beer began in college after graduating and beginning a career in the medical industry. Chad is now head brewer at the NoDa Brewing Company. When it came to him landing a career as a brewer, Chad had no idea how he would get there, but he dove head first into his passion. He attended and often worked many craft beer festivals. He networked with many individuals within the beer industry. He hosted his own beer events and eventually connected with the soon to be owners of NoDa Brewery. He helped to build the brewery form the ground up and took on the role as head brewer. It was through his passion for craft beer that he attained his dream life. Click here for the Chad Henderson TEDxCharlotte profile. Urban Ministry Center of Charlotte offers aid, soup kitchen, community programs, housing opportunities, and treatment assistants to area homeless. Dale’s dream is to end homelessness while healing volunteers’ souls at the same time. Dale charges that most people glaze over when the conversation turns to the subject of homelessness because this social issue seems too big for any one person to make a significant change. Dale said that when a person’s deep gladness (i.e. passion) intersects with addressing a human need, extraordinary changes can occur. Dale went on to tell the story of three extraordinary volunteers that changed the way the Urban Ministry Center approached volunteerism. These volunteers shared their passion for murals, soccer, and gospel music with the Urban Ministry Center. The Center then began to create impactful programs centered on these activities. Many of the homeless individuals who decided to participant in these programs are now off the streets, off drugs, and back to work. The current volunteer philosophy for the Center is now “Come and tell us what you have to offer, and let’s see if we can make it happen with homeless people,” explained Dale. 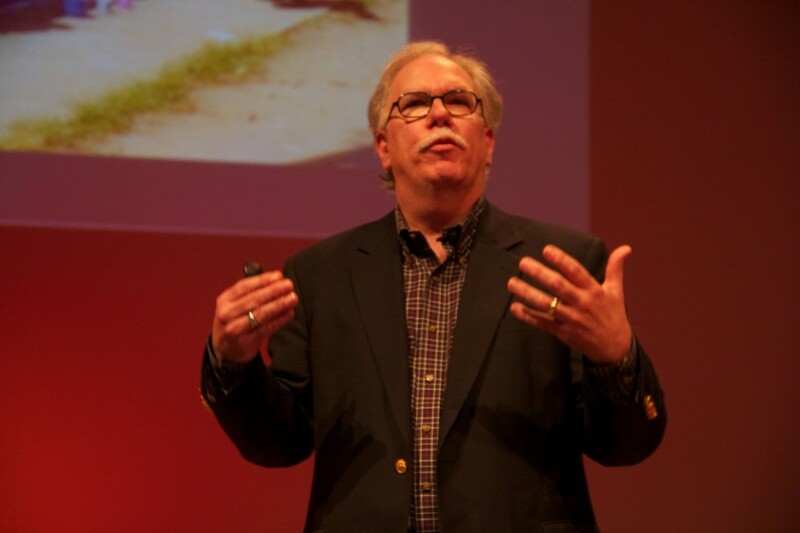 Click here for the Dale Mullenix TEDxCharlotte profile. 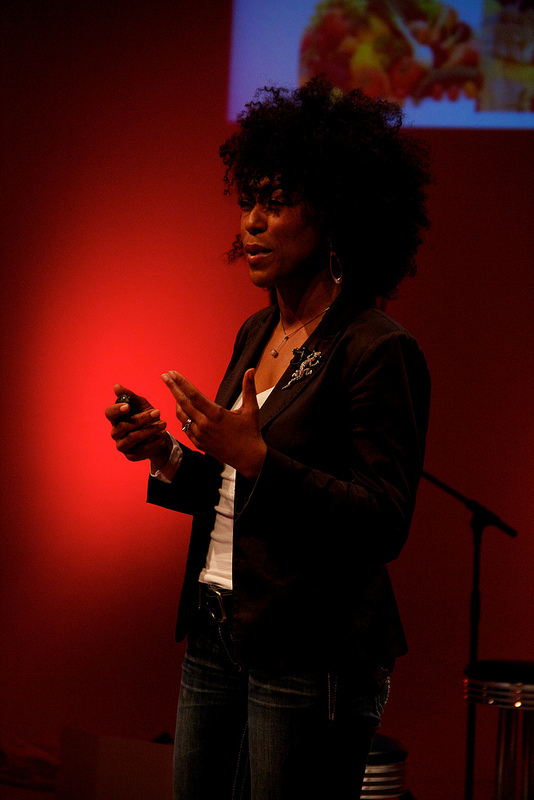 For TEDxCharlotte speaker Robin Emmons has a personal connection to the homeless community. This connection pushed her to develop a non-profit that employees the homeless while eliminating fresh food deserts in Mecklenburg County. In 2008, Robin quit her Corporate America and not long after began caring for her homeless older brother. He had been living on the streets for nearly a decade without a proper mental health diagnosis. Once Robin’s brother was placed in the prison and mental health system Robin began to follow him through the typical state system process. The courts eventually granted her guardianship of him. Throughout his time on the street and in the state system Robin felt her brother’s dietary habits needed an extreme revamping. This served as the inspiration that led her to create the non-profit Sow Much Good, which promotes healthy, locally grown food through neighborhood farming efforts. Sow Much Good produces eight tons of fresh food per day for members of the local community. Click here for the Robin Emmons TEDxCharlotte profile. 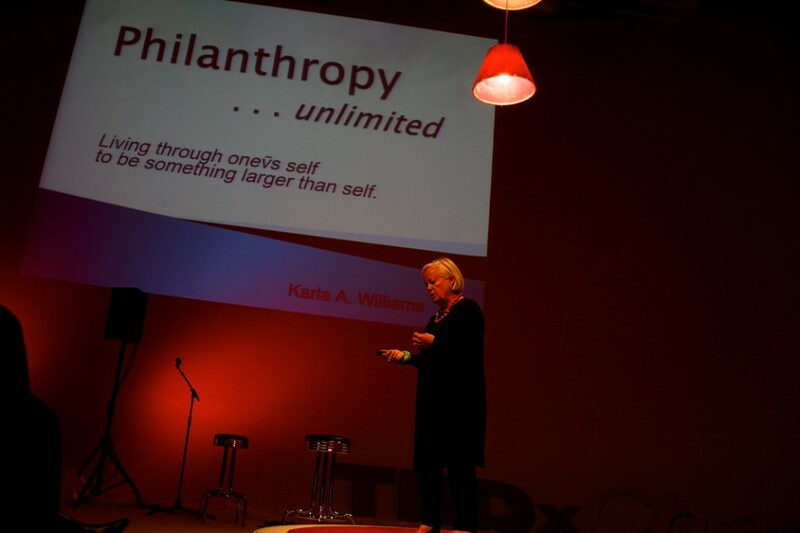 Karla Williams, principal of The Williams Group which helps nonprofits accomplish unlimited goals with limited resources, came to TEDxCharlotte to champion the non-profit sector. She came to help attendees realize the unlimited possibilities this sector offers to those who choose to participate in it. Karla said that civic engagement in Charlotte was low and this was a fact that had to change. With there being approximately 4,000 non-profits in the Charlotte area alone, qualified employees and volunteers are needed to help these non-profits grow and flourish in the community. According to Karla, Charlotte is currently ranked 38th out of 50 in the nation when it comes to civic engagement. Click here for the Karla Williams TEDxCharlotte profile. Molly Barker, founder of Girls on the Run and TEDxCharlotte speaker veteran, sat center circle on the TEDx stage and began to share a letter of filled with vulnerability and self-actualization. Her letter was addressed to the US Congress. Within the letter Molly shares her frustration with Congress’s behavior. She also exposed her inner struggles, while she found her inner strength to carry the title of leader. Through tough tears and emotional pauses Molly shares her private letter to Congress to an audience of 450 and three cameras and everyone was soaking up every word. Read her letter to Congress here. Igor Jablokov, CEO of Yap, Inc., a privately funded startup in mobile speech and wireless technology, was the final TEDxCharlotte speaker for 2013. His message to the audience was to act NOW rather than later because failure is easier to deal with than regret. 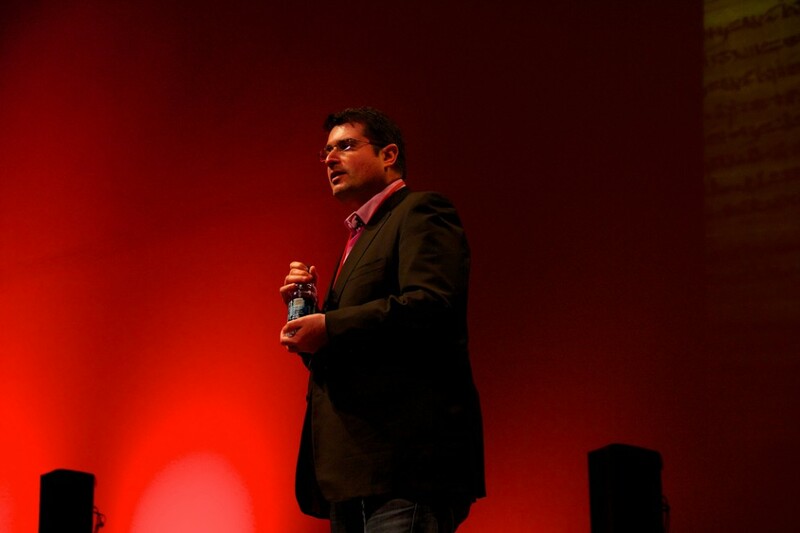 Click here for the Igor Jablokov TEDxCharlotte profile.